How far would you go for a friend? Grateful Chuck owes Larry for saving his life on the job, and Larry calls in that favor big time when civic red tape prevents him from naming his own two kids as his life insurance beneficiaries. All that Chuck has to do is claim to be Larry's domestic partner on some city forms. Easy. Nobody will ever know. But when an overzealous, spot-checking bureaucrat becomes suspicious, the new couple's arrangement becomes a citywide issue and goes from confidential to front-page news. 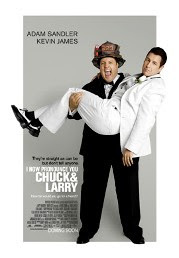 Forced to improvise as love-struck newlyweds, Chuck and Larry must now fumble through a hilarious charade of domestic bliss under one roof. And after surviving their mandatory honeymoon and dodging the threat of exposure, the well-intentioned con men discover that sticking together in your time of need is what truly makes a family. The movie was pretty funny and true to Adam Sandler's style. Just the sort of light entertainment I needed :) My hugest laugh-out-loud moment was definitely the fireman shower scene - pahahahaha! Saturday was an early morning. Had to get up and off to some ridiculous branch of Standard Bank to pick up my cheque card - which I found out had been there since the end of June (!!). But, in an effort not to let myself wander down the road of depression over what useless service providers we settle for, I won't discuss this any further right now. Because, after the weekend, I'm actually feeling a lot better and I think I'm almost over my complete loss of faith in humanity. 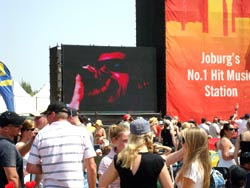 Then it was off to Joburg Day for a Saturday in the sun :) We arrived just before midday, just in time for Wonderboom, who I was absolutely dying to see. You see, I think Cito (their lead singer) is truly divine to watch live on stage (it's a pity he doesn't photograph quite so well tho) and the last time I saw them was about 2 years ago ... Boy was I in for a disappointment that left Varen grinning madly. It seems that Cito has forgone his hotness and grown out his hair (I know it's been longer before, but that was before I first saw them live!) and is now sporting a mustache and beard :( I was devastated, watching him perform live was half of why I was there - okay, a third ... I was looking forward to Freshlyground and curious to see Mango Groove. Sunday was equally relaxing and we slept till we woke up (this has been sorely lacking from my weekends recently!) and proceeded to eat Coco Pops in our PJs watching more Numbers till about midday :) Then we popped over to his folks and ended up staying for lunch. The weekend finished as we concluded Numbers Season 2 :) It was a good change of pace from last weekends mad rush of events.